Smitten With Bad Boy Heroes: Mortal Path: Dark Time: Mortal Path Book 1 Ebook on SALE! 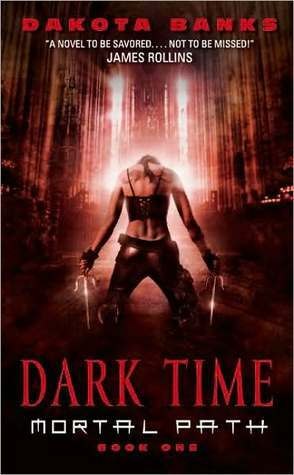 Mortal Path: Dark Time: Mortal Path Book 1 Ebook on SALE! Harper Voyager is providing a special opportunity to acquire the ebook version of the first book in the Mortal Path series, Dark Time. Regularly $7.99, the ebook is on sale for $.99! This is a great chance to introduce yourself to the Mortal Path series, or if you're already a fan, to go back and pick up the first book for your e-reader. Available NOW and for a limited time only. Growing up in a 19th-century funeral home might have set the tone for Dakota Banks's life. In her debut fiction, she proves the point by conjuring up an infernal tale about a burned-at-the-stake witch who refuses to let bygones be bygones. Two hundred years of savage carnage later, the demonically inclined Susannah Layton, now known as Maliha, decides that she wants to retire, but unless she can perform some good deeds quickly, she will be consigned to the very hottest parts of hell.